There are many different ways of using Social Media. The most used way off course is talking about yourself or for ‘marketing’ purposes: tweeting about your brand and trying to engage with your audience. But there are more ways in which you can use Social Media. Non-Commercially. Let’s take a look at some ways Social is used to make life a little bit easier, without the intention to sell or buy or market a product or service. Social Media connects people. People talk about what they see, hear and do. So why not make use of that principle and use people on Social Media to make the world a safer place? It is actually quite similar to animal behaviour. Just think of how troops of animals in the wild react when danger is around the corner: they warn each other. Social Media is now the human equivalent of that. One of Twitter founders Ev Williams saw what Twitter could do in a very early stage. When other founders were still focussing on Twitter being a ‘status update’ tool, Williams saw the opportunity that it could be more of a tool which would allow you to tell the world ‘what is happening around you’. And that is what people are doing. Which also means that people could be tweeting about crimes in their neighbourhood, to find the ‘bad guys’ or simply to warn others. So what you can see a lot on Twitter these days is tweets ‘Neighbourhood watch tweets’, people warning each other. And that has extended into actual services monitoring this and centralising the updates. An example of how humans in some cases aren’t even needed to share the danger on social is the tagging of sharks in Western Australia. Government researchers there tagged over 300 sharks with transmitters. These (acoustic) transmitters monitor where the animals are. As soon as one of them gets to close (half a mile away) to a beach where people might be an alert goes out. This alert then triggers a tweet to be sent out on the Surf Life Saving Western Australia Twitter feed. It allows people to get the hell out of there. If necessary that is, because it also shows the shark’s size, breed and location. Which will make that people can decide for themselves if they need to run for their lives. 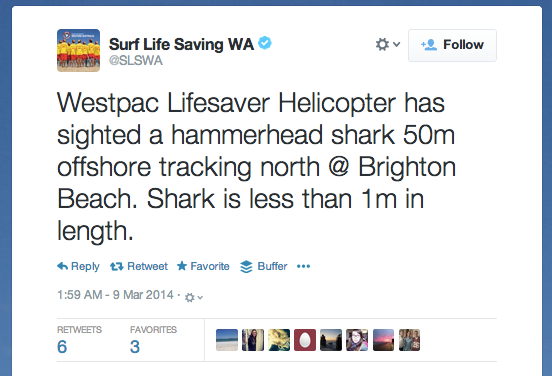 The government in Western Australia let’s sharks tweet. Really. 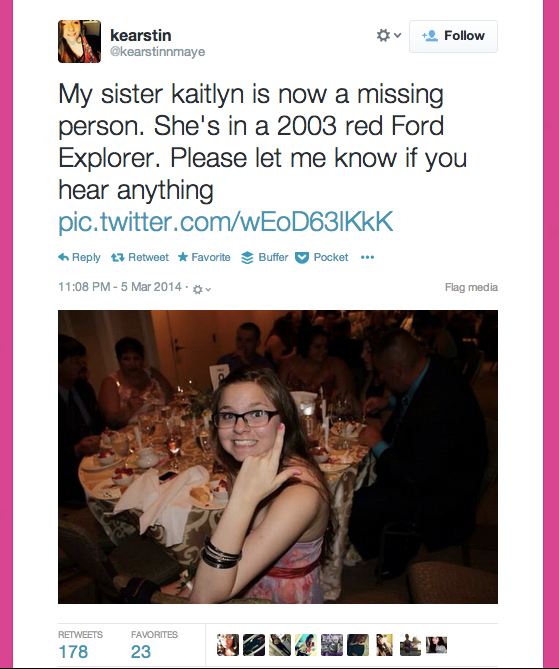 You must have seen them come by in your streams: a tweet or Facebook update about a missing person. By asking others to retweet or re-share the word gets around that someone is missing and if someone has spotted that person Social Media can help getting these people back. The ‘problem’ with these however is that they are not always true. And when you see too many of them you start mistrusting them and ignoring them. Which means that the ‘good ones’ miss out. E-Bay is very successful. As are many related services. Websites you can sell your own stuff on or find bargains. The ‘problem’ with these sites however is that it is becoming quite crowded there, plus it is not always very local. So now you see groups on Facebook where ‘locals’ gather to buy, sell or swap items. 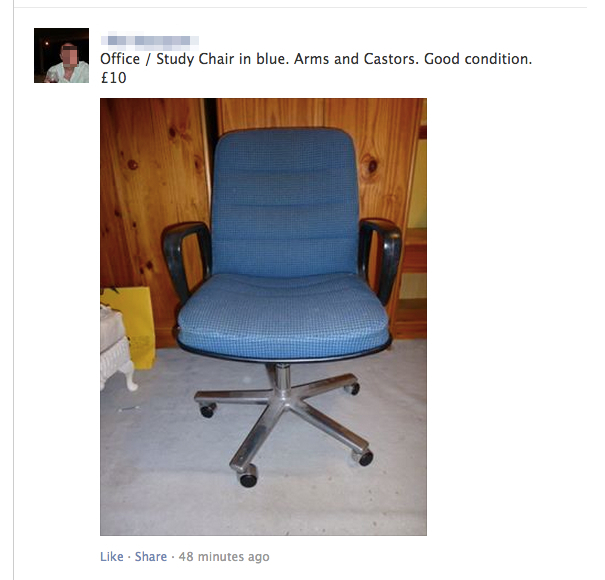 Have an old office chair you want to get rid off? Throw it on Facebook! Using Social instead of E-bay to sell or buy products. This is an obvious one. In the ‘old days’ when you were looking for people with the same interest you would find a forum and discuss your hobby there. These days Social Media has partly taken over that role. If you are a fan of a football team for example, it’s really easy to find groups of people who are fans as well. It’s easy to connect and share the interest using Social Media. Scientists are not the easiest people to convince they should take their research ‘outside’ of their labs. In most cases they don’t want anything to do with publishing content on places which are not recognised scientific journals. 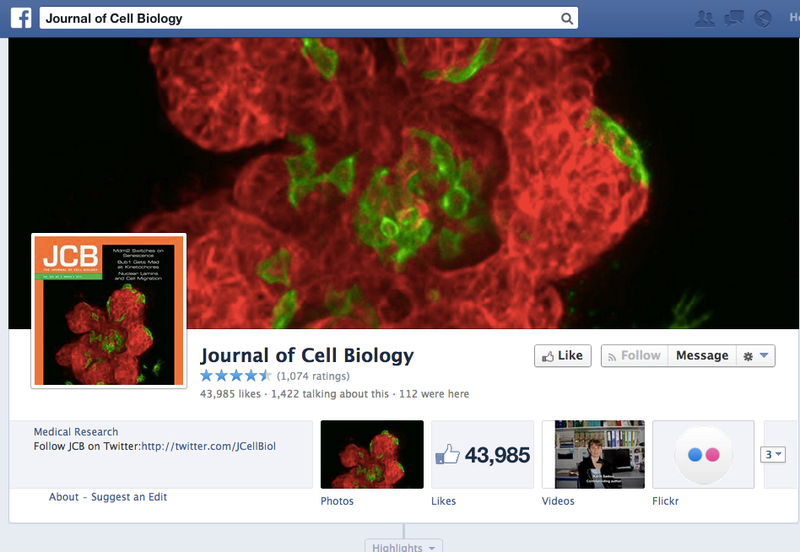 Yet if you really dive into Social Media, you will find a lot of scientists active there. Sharing, testing and connecting. They use Social Media to share their ideas, discuss them or they try to get funding for their research. It really helps them get forward. So this is State of Digital. And here we try and figure out how marketers can use Digital for their marketing efforts as best as possible. So why are we then looking at non-commercial ways of using Social Media? Simple: because it teaches us a LOT about the people we are dealing with in our marketing efforts. By looking at this we can improve the way we do marketing. There are a few lessons we can learn from this. For a start: analysing the behaviour of people on Social Media will show that as a brand you don’t want to go ‘disturb’ the non-commercial conversation. Even though people are in a group in which they are selling and buying products from each other, they don’t want to see commercial stuff in there. If you are getting in there to sell your product the effect will most probably be the opposite of what you want: people will start hating your brand. Instead you want to stay out and monitor. Monitor what they are doing, what they like and adjust your marketing messages to that. It is also a good way of finding the right influencers, people who sell a lot or but a lot, and approach them outside of the public eye. Simply said: use it wisely, not as a sales platform. Sometimes we think dollar signs when working social. Seeing non commercial uses can help you detach from the money side of things to focus on the connecting side of things. Great share! Another good business use of social media is the “atta boy” (or girl). Why not applaud or pat a team member on the book in front of all their friends? Good potential for employee morale, and that does impact bottom line.